Why Are There So Few Civil War Films? HomeDailyCivil WarWhy Are There So Few Civil War Films? The Civil War has never been a particularly fruitful subject for American moviemakers. The real-life characters are too vivid to be reinvented. World War II, America’s last “good war,” has always been a fruitful source for homegrown moviemakers. Beginning with the wartime movies that shamelessly if sincerely promoted American efforts to rally against the fascist evils of Germany, Italy, and Japan, the silver screen gave audiences stirring depictions of brave GIs risking and sacrificing their lives for the greater good. Even as filmmaking techniques have grown increasingly sophisticated in depicting the real horrors of war (see story, page 36), such films as Saving Private Ryan have still underscored the basic, old-fashioned decency of American soldiers in World War II. Ironically, the war that truly shaped the modern-day United States has been comparatively underrepresented by American movies. Beginning with director D.W. Griffith’s controversial The Birth of a Nation in 1915, Hollywood has shown a persistent but shallow interest in the Civil War. Griffith, the son of a Confederate veteran, cared little for the complex issues that led to the war and its aftermath. Instead, he set out to craft a partisan indictment of postwar Reconstruction. Virginia-born President Woodrow Wilson, seeing an advance screening of the film at the White House, memorably praised Griffith for “writing history with lightning,” even if it was more lightning than history. Most famously, the 1939 film Gone With the Wind etched an idealized, “moonlight-and-magnolias” portrait of an Old South that only existed in frothy romance novels and on movie screens. 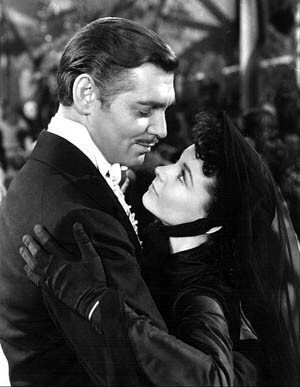 Still, with such larger-than-life stars as Clark Gable and Vivien Leigh and its vivid if now rather dated storyline of noble cavaliers, intrepid southern belles, and happy, loyal slaves,Gone With the Wind was a blockbuster success. It was the Civil War that people wanted to imagine—even, inexplicably, many northerners. Perhaps the best Civil War ever made—faint praise though it may be—is writer-director John Huston’s 1951 version of Stephen Crane’s remarkable novel, The Red Badge of Courage. Starring real-life World War II hero Audie Murphy as the reluctant, ironic hero Henry Fleming, the movie succeeds in giving viewers a slight inkling of what the war was like on the level of the humble Union foot soldier. Despite its good intentions, however, Huston’s movie still presents a fairly well-scrubbed version of the decidedly dirty Civil War—down to the immaculate blue uniforms worn by Murphy and his comrades. Two 1960s movies with Civil War themes, The Little Shepherd of Kingdom Come and Shenandoah, reveal the traditional Hollywood penchant for combining questionable history with cornball sentimentality, although at least the latter movie, with the great actor James Stewart as its star, manages on occasion to rise above its mawkishness. By contrast, The Little Shepherd of Kingdom Come, starring folk singer (and nonactor) Jimmy Rodgers, gives viewers the hilarious sight of a supposed Civil War battle taking place amid California’s characteristic tall pines and sequoia trees. Presumably, it was cheaper to film there than on location in the American South. The well-received 1990 film Glory, dealing with the formation of the Union Army’s first African American regiment, the 54th Massachusetts, was an honorable effort to dramatize an interesting if essentially secondary Civil War event. Critics at the time pointed out that Glory was less a true Civil War movie than an update of the old World War II-era formula movies in which a group of disparate personalities is welded into a cohesive and brotherly fighting unit. The movie also gives the false impression that only black troops fought at the climactic Battle of Fort Wagner, although white units such as the 7th New Hampshire also shared in the suffering and glory. Perhaps the real problem with making a movie about the Civil War is that the truth itself was so remarkable. What high-paid screenwriter could create a fictional character to rival Robert E. Lee, Stonewall Jackson, or Abraham Lincoln? Or a situation more poignant than Pickett’s Charge or Lee’s surrender at Appomattox? Poet Walt Whitman, who saw much of the war’s aftermath in the Army hospitals around Washington, D.C., famously lamented that “the real war will never get into the books.” Nor, one might add, is it likely to get into the movies. Tags D.W. Griffith, Gone With the Wind, hollywood, The Birth of a Nation.